My Three Doxsons: I look down and I see my wiener! 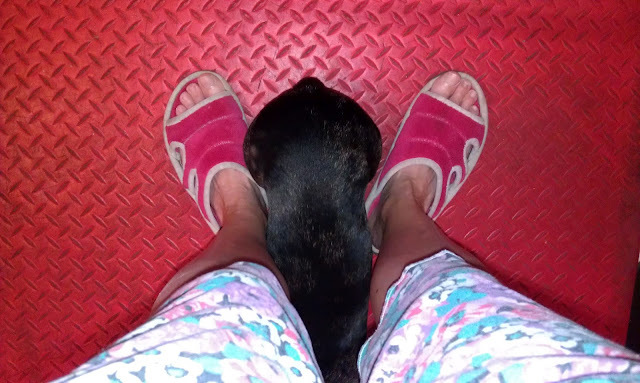 I look down and I see my wiener! I look down and see my wiener, and its on the floor. 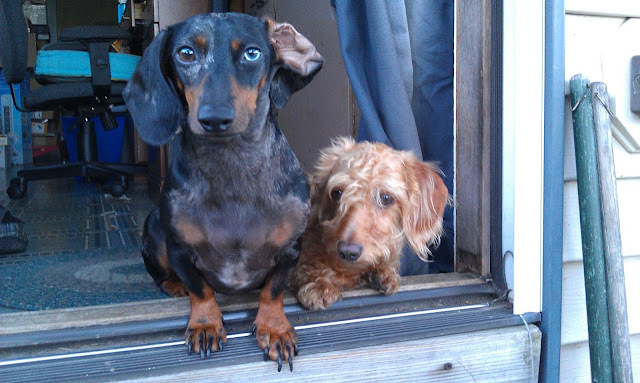 Since I am female I am awful glad that as I look under the bottom edge of my dress I see my favorite black and tan, dapple, with one blue eye, mini dachshund, Spaatz. Also known as Babyman, Goopey, Spaatzen, Spaatzle, Sputzie and probably a few other things. This is where he likes to sit when I am doing things in the kitchen. It's probably a combination of him feeling safe there and his guarding me. I am his person. Make no mistake about that. Spaatz and Miss Peachy are in cahoots and anyone who dare to challenge them can kiss their ankles goodbye. One handsome dude and his girl.